The cute toe baring sandals are out and summer colors are cheerfully singing bright on our finger tips. Whether you treat yourself to a mani/pedi at your local nail salon or you spruce those puppies up at home, we are here to give you the DL on all things hot for your fingers and toes this summer. 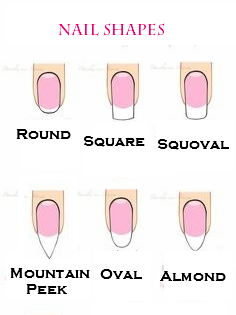 First thing first, nail shapes. Believe it or not there are tons of popular and achievable nail shapes out there these days. 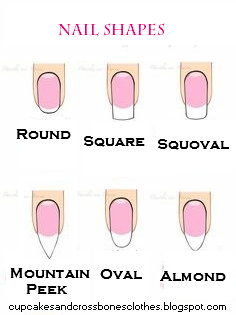 Copy these shapes at home or bring this list with you to your local salon to get a copycat shape that suites you best. Out of all the nail shape trends out there the one I would have to tell you, friend to friend to steer clear of are the "duck feet." No....just please....no. Now onto the fun stuff! Colors colors and more colors! We compiled a chart with 2 different nail polish brands and the hottest colors out there this summer. The choice is up to you whether you want to save or splurge. Save: Wet n' Wild- I personally love Wet n' Wild's Mega Last polishes. They last longer than most of those expensive brands, they have a huge array of colors, and the thick brush tip makes it super easy to swipe once on each nail and move onto the next. I usually use two coats of the Mega Last polish when painting my own nails and then a clear top coat. 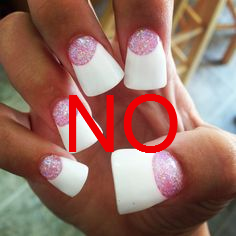 By doing this I am able to keep my nails chip free for about a week. Splurge: Essie- Essie has what I believe is the greatest variety of colors and shades around. You are always able to find the perfect color to match that outfit for a hot night out on the town when shopping for Essie polishes. The only down side is that they are a bit pricey if you are purchasing them to DIY at home and to be honest, my nails chip a little sooner than I would like when I wear this brand. Lastly, when in doubt every girl always has her "go to" polish color that she always leans towards and has grown super comfortable with. 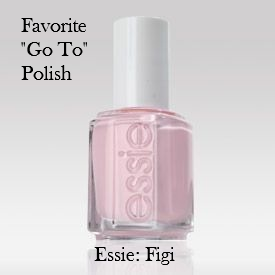 My personal favorite "go to" color would have to be Essie's Figi. This soft and neutral color is so versatile and always looks clean and classy on any freshly manicured pair of fingers or toes. Which color and shaped nails will you be rockin this summer? What is your "go to" polish color? I think I'm starting to like the oval I used to love squares but now that I'm growing out my natural nails I'm liking the oval look! the almond shapes weird me out!